Oh yes, Kitty, I would love to join you for tea. Love the pumpkin teapot. That pumpkin bread looks so good! I think that your adorable pumpkin teapot is the long-lost cousin of my pumpkin teapot that I shared today. It never occurred to me to try pumpkin bread with cream cheese. What a yummy idea! Pumpkin bread sounds wonderful Kitty! I haven't made a bread in ages as I have just recently started to bake again. I'm finding it very difficult with my hand however. 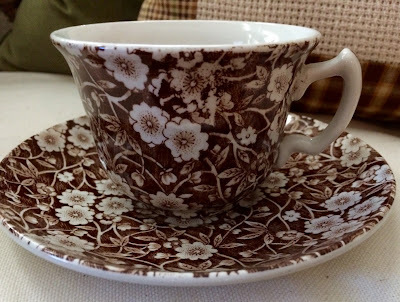 I adore Calico and your teacup is simply perfect for Autumn! Your pumpkin teapot is adorable. I never see one around here and I'm sure if I did I would pick it up because I do have a 'thing' for pumpkins. Have a beautiful day, sweet friend, and thank you for the tea and bread. I love your little teapot!! So cute! I don't have any brown teacups! Think I'll have to look for one! Yours is lovely! Yummmmmm pumpkin bread! One of my favorites! One of things I love about fall is all the pumpkin goodies! That looks delicious Kitty! Cissy's little guys are so cute! Love the pumpkin teapot and Calico teacup...favorites! Have a lovely week and thanks for linking to Tuesday Cuppa Tea. What an elegant post in Fall colors!Love your unique teapot and gorgeous teacup!Love your pillow too!Your bread looks yummy.Hugs!Maristella. 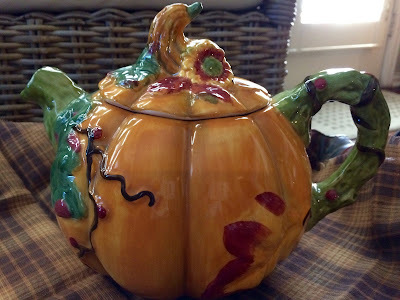 What a cute pumpkin teapot - perfect for October! Pumpkin bread is always delicious. I would love to sit and enjoy a slice of pumpkin bread with you Kitty, it looks delicious. The pumpkin teapot is so adorable, I know you are enjoying using that. Your sweet Cissy is adorable, love that smile.........Have a wonderful week. I’m with you...I don’t give into buying new stuff much anymore unless I think it just HAS to come home with me. I like thinking of new ways to use my “old” pieces. It’s nice to get reacquainted with pieces I haven’t used in forever! Sadly, there are pieces I’ve had for months or years that have NEVER been used. Pumpkin bread sounds good. It’s supposed to only get up to about 45 here tomorrow. Perfect weather for it! I quite buying new seasonal stuff, too, and concentrate on using what I have...even with that I have given a ton of it away now..and I still have a lot left. Your pumpkin recipe sounds delicious! I love the Pumpkin teapot and the Calico teacup. Looks like Cissy had a great time! I would love to look in all you cupboards, Kitty, to see what beautiful china is hiding there. No, you have no need to decorate with all those beautiful teapots, teacups and other pretties you seem to have in abundance. That pumpkin bread looks delicious. One of my favourite veggies is pumpkin. Yes, I'm trying not to buy new dishes either! Your teapot is the cutest and I love the calico cup! I believe my recipe is the same as yours and it is tried and true. 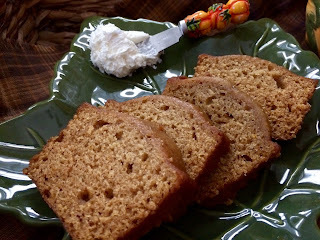 I do love pumpkin bread and with whipping cream, yes please! I'm wishing I had some right now for breakfast! I could eat my weight in pumpkin bread! OH...but that wouldn't be good...that would be A LOT of pumpkin bread! Loving that beautiful brown teacup and what an adorable teapot! Hugs on a Tuesday! Hi Kitty, Love this recipe and thank you for sharing it. Love your darling cross stitch pillow and your tea setting is beautiful. I have that same teapot! Your teacup is so pretty too. Hello Kitty, oh the pumpkin candy looks so cute. 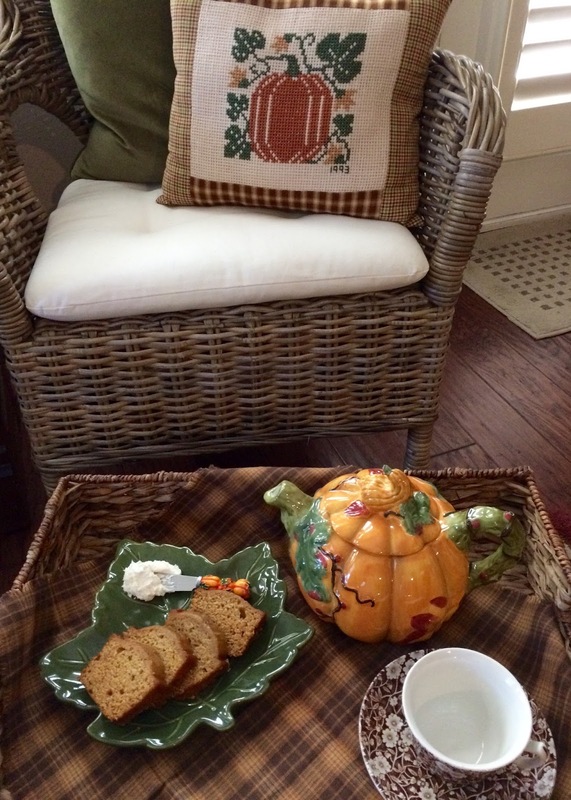 Thanks for sharing this pumpkin bread recipe at C&C with J&J. Mmm Pumpkin Bread, Kitty! I think I am gaining lbs the longer I look at your picture! Love the pumpkin teapot. So sweet! The pumpkin bread looks and sounds delicious, Kitty, I love the teapot and the cup and saucer are very pretty too! Thanks for sharing the recipe. Oh how I LOVE pumpkin bread!! It's not in my diet plan right now but I'm saving your recipe anyway! I'm kind of with you on the decorations. I really don't buy much new any more and in fact, I'm getting rid of a lot when I do decorate. You know, things I haven't put out in years! Your pumpkin and leaf plate are so pretty! Kitty, I love pumpkin bread, cake, muffins, pie, etc! And your pumpkin teapot is adorable. I think you're really smart to not keep buying new decorations every year for various occasions, especially when what you already have is perfect. I love Cissy little pumpkin men, so cute! Your amazing Pumpkin Bread would be a big hit here at the cottage! I really appreciate you sharing your awesome post and your talent with us at Full Plate Thursday. 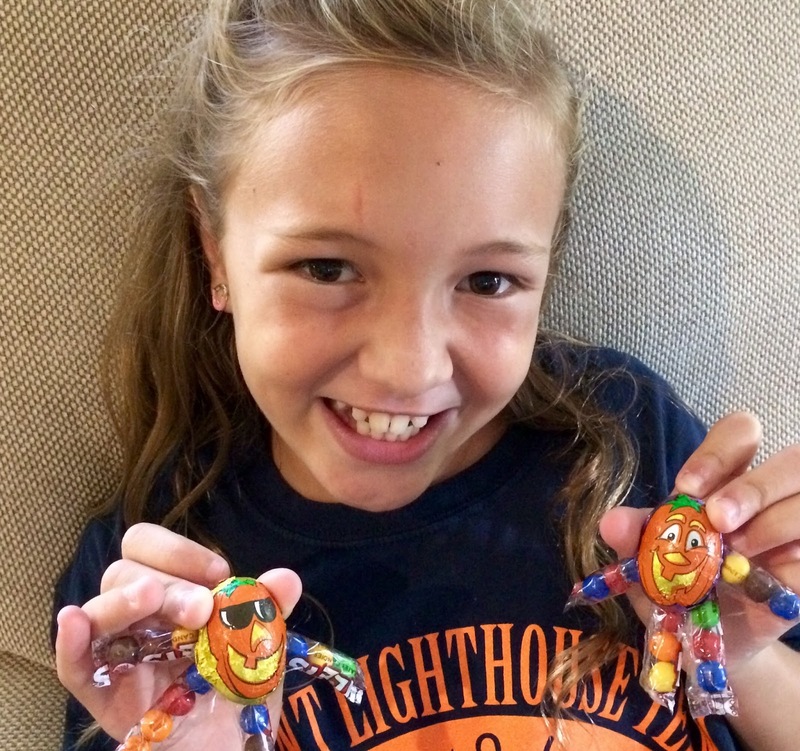 How adorable Cissy's pumpkin head people. Pumpkin bread is so good. It makes me happy with the lovely flavor and the wonderful aroma of the spices. Loving the sweet teapot. You always create such a pretty vignette Kitty. Happy weekend. I've been making pumpkin bread for years as well. It's my favorite quick bread. This last time I tried to make it "healthier." Not a good idea. Don't mess with perfection, right? I think my recipe is the same as yours. It's a good one. I love how you don't buy decor anymore; just bring out the favorites. The favorites are the ones with all the good memories. Pumpkin time is here and Kitty is leading the way! Lovely! Kitty, my computer hard drive appears deceased so no blog party this week. I thank you for always participating and sharing your lovely fall tea wares. Love Calico in the brown (I have a few of those too)!